Broken Boulder Vineyard is the estate vineyard for Stave & Stone Winery. With a view of both Mt. Hood and Mt. Adams, we grow Pinot Noir, Pinot Gris and Chardonnay varietals. 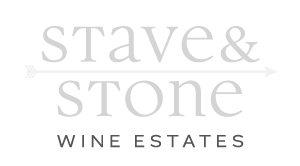 Besides happily using them in our Stave & Stone wines, we also sell grapes to wineries and winemakers; please click here to request purchasing information. We began as a family farm almost 100 years ago, producing apples and pears. In 2004 the orchard’s age required replacing the trees or trying something new. We grew hay for several years to add nitrogen back to the soil, as the dream of owning a vineyard and winery began to take shape. Nothing worthwhile is easy, and we had plenty of challenges along the way. We planted our first block of Pinot Noir in 2012. Broken Boulder Vineyard gets its name from the enormous basalt boulders that graced our fields, courtesy of Mt. Hood thousands of years ago. These huge rocks hid just under the surface to make straight lines for trellis and irrigation systems impossible. We weren’t about to give up, so we hired an excavator to pull them from the soil. Piles of these boulders are at the end of every vineyard block; we say you may “adopt a rock” if you bring a crane and a flatbed truck. We’re often asked about our winery name’s origin. Obviously the “Stone” in Stave & Stone comes from the vineyard boulders. “Stave” is more complicated; the first thing to know is that our family name, Fletcher, means arrow maker. “Stave” therefore has an irresistible double definition, as it refers to a rib of a wine barrel and it can also mean an archery bow. There is a mindful significance behind everything surrounding our vineyard and winery, and we invite you to enjoy the delicious results.